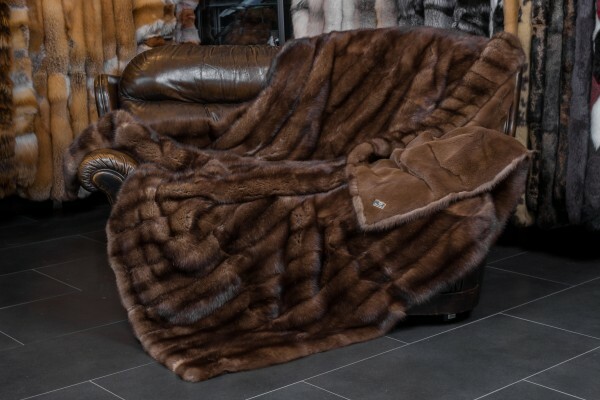 Discover the unparalleled luxury of a Barguzin sable fur blanket. Prized for centuries by the nobility of Europe, the distinction of sable is now available to you in one of our premium quality fur blankets. Made by hand at our workshop in Kiel, Germany, Our expert team of furriers and tailors combines the finest furs and materials with a great deal of technical expertise. To enhance the luxury of this blanket, we have added a plucked ermine backing. Don't miss out on the chance to enjoy one of the most prized furs in history. Express shipping: After receipt of payment the blanket will be delivered in 1-3 business days. Of course, we can make this sable fur blanket in any size you want. Please note, however, that this would lengthen the time of delivery ca. 2-3 weeks. Related links to "Sable Fur Blanket made from Barguzin sable"
Customer reviews for "Sable Fur Blanket made from Barguzin sable"